Tourists take a boat to Liberty Island, a short distance from Manhattan. New York was among the top destinations of nonimmigrants in 2008. Consider these common categories of foreigners you might encounter in a U.S. city: the camera-toting tourist, the executive of a multinational company, and the PhD student. One thing they all share, no matter which country they came from, is their status as nonimmigrants. In 2008, the United States counted 39.4 million nonimmigrant admissions, the highest level since 1990. This updated Spotlight takes a detailed look at the admission statistics of foreign nationals who came to the United States on a temporary (nonimmigrant) visa in 2008 and who have to complete an I-94 arrival/departure form (more about the I-94 form on this page of the U.S. Customs and Border Protection website). The data are from the Annual Flow Report Temporary Admissions of Nonimmigrants to the United States: 2008 and from tables published online, all from the Department of Homeland Security's Office of Immigration Statistics (OIS). The total number of nonimmigrant admissions to the United States more than doubled from 17.6 million in 1990 to 39.4 million in 2008. Temporary visa data gathered by the Department of Homeland Security (DHS) counts admissions, not individuals, of those who are admitted with an I-94 form. In some cases, temporary visa holders may enter the country more than once in any given year. In 2008, nine out of 10 nonimmigrant admissions were temporary visitors (tourists and business travelers). Citizens from three countries — Mexico, the United Kingdom, and Japan — accounted for more than 40 percent of all nonimmigrant admissions in 2008. Nationals of South Korea, China, India, and Japan made up a third of all foreign academic student admissions in 2008. Nonimmigrants from India composed more than one-third of all H-1B "specialty occupation" worker admissions in 2008. Nonimmigrants from Mexico and Jamaica accounted for three-quarters of all H-2B seasonal nonagricultural worker admissions in 2008. Four states — California, Florida, New York, and Texas — were the intended destination for half of all nonimmigrant admissions. According to U.S. immigration law, nonimmigrants are citizens of other countries who have received a particular type of visa and enter the United States temporarily for a specific purpose. Nonimmigrants are also referred to as temporary admissions. There are more than 70 classes of nonimmigrant admissions, including tourists, business visitors, students, H-1B workers, religious workers, intracompany transferees, diplomats, and representatives of international organizations. Upon admission, nonimmigrants are restricted to the activity or reason for which their visa was issued. For example, a person admitted as a tourist (i.e., a temporary visitor for pleasure) is not allowed to work or study unless he leaves the United States and enters on a work or student visa. For example, a woman comes to the United States as a student. While on a student visa, she marries a U.S. citizen. Her spouse can petition DHS on her behalf to adjust her status from a student to that of a lawful permanent resident. Family reunification would be the basis for her adjustment (see the Spotlight on Legal Immigration to the United States). If the couple meets all required criteria, she will receive a "green card" stating she is lawfully admitted for permanent residence. Although there is no overall cap on how many nonimmigrants can be admitted to the United States per year, Congress sets a numerical limit for some categories of nonimmigrants. These categories currently include temporary skilled workers (65,000 H-1B "specialty occupation" visas for first-time applicants plus 20,000 visas for foreign graduates of U.S. advanced degree programs), seasonal nonagricultural workers (66,000 H-2B visas), treaty aliens in specialty occupations (10,500 E-3 visas), victims of trafficking (5,000 T-1 visas), and victims of criminal activity (10,000 U-1 visas). Nonimmigrant admissions are recorded for each arrival. A nonimmigrant may travel on the same (or different) visa back and forth between the United States and another country within the same year. Every time this person enters the United States, the entry is recorded and added to the total number of admissions for that fiscal year. Therefore, the count of admissions exceeds the number of individuals arriving. There are a number of reasons for this difference. First, not all foreign nationals need a visa to enter the country. Nationals of 35 countries that are part of the Visa Waiver Program (including most European Union countries, Canada, Japan, and South Korea) can travel to the United States without a visa if they come for a period of less than 90 days as tourists or business travelers. Second, most nonimmigrant visas are valid for several years. And third, some people may choose not to travel to the United States even if they obtain a visa, or they may choose to travel in the next (fiscal) year. In 2008, there were about 175.4 million nonimmigrant admissions to the United States, of which 135.6 million (77.5 percent) were exempt from completing the I-94 arrival/departure form at the port of entry. Two groups account for these nonimmigrant admissions: Canadians who travel to the United States for business or pleasure, and Mexicans who possess a nonresident alien Border Crossing Card (i.e., laser visa). DHS only reports characteristics of I-94 nonimmigrant admissions. 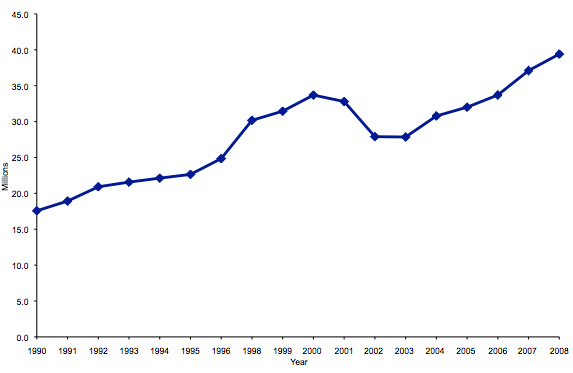 Temporary admissions of I-94 nonimmigrants to the United States increased 2.2 times from 17.6 million in 1990 to 39.4 million (not including the admission of certain Mexicans and Canadians) in 2008 (see Figure 1). Between 2007 and 2008, temporary admissions of I-94 nonimmigrants increased from 37.1 million to 39.4 million or 6.4 percent. A number of factors caused the 15.1 percent drop in nonimmigrant admissions between 2001 (32.8 million) and 2003 (27.8 million), one of which was increased scrutiny of visa applicants following the September 11 terrorist attacks. However, the upward trend resumed after 2003. Source: Data from 1999 to 2008 are from the Department of Homeland Security, "Data on Temporary Admissions (Nonimmigrants), Table 25," in Yearbook of Immigration Statistics 2008 (Washington, DC: DHS, 2009); data from 1990 to 1998 are from the Department of Homeland Security, "Data on Temporary Admissions (Nonimmigrants)," in Yearbook of Immigration Statistics [2003 and 2007 editions] (Washington, DC: DHS). Similar to the past, temporary visitors accounted for an overwhelming majority of all arrivals. In 2008, they represented 89.0 percent (35.1 million) of all admissions to the United States (see Figure 2). Of those, 29.4 million were tourist admissions and 5.6 million were business-traveler admissions. 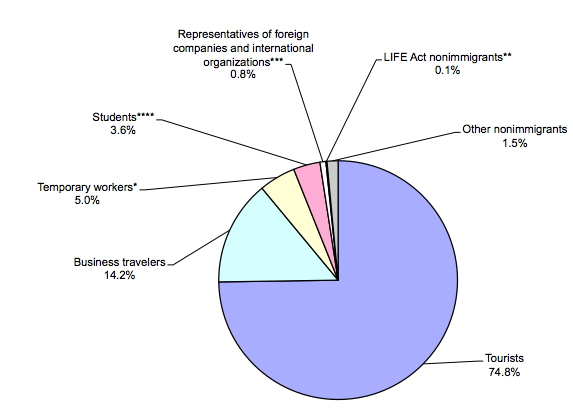 Temporary workers and trainees, including H-1B "specialty occupation" workers, registered nurses, temporary agricultural workers, North American Free Trade Agreement (NAFTA) professional workers, treaty traders, and intracompany transferees, among others, accounted for 1,949,695 arrivals (5.0 percent of total admissions); this figure includes spouses and children of all temporary workers and trainees. Students who came to the United States to study at academic or vocational institutes together with their family members made up 3.6 percent (1,424,613) of total arrivals. Source: Department of Homeland Security, "Nonimmigrant Admissions (I-94 Only) by Class of Admission: Fiscal Years 1999 to 2008, Table 25," in Yearbook of Immigration Statistics 2008 (Washington, DC: DHS, 2009). Notes: *Temporary workers, trainees, treaty traders, intracompany transferees, and their families, plus representatives of foreign media; **U.S. citizens' fiance(e)s and their families, and certain immediate family members of legal permanent residents; ***Foreign government officials and representatives to international organizations and their families; ****Foreign students and exchange visitors and their families. Citizens from Mexico (7.3 million), the United Kingdom (5.5 million), and Japan (3.9 million) accounted for 42.3 percent (16.7 million) of all temporary admissions in 2008. Citizens from Germany and France accounted for another 3.8 million admissions or 9.7 percent. Indians and Italians, with 2.2 million admissions combined (1.1 million each), made up another 5.6 percent. Nationals of these seven countries, together with those from South Korea (2.6 percent or 1 million), Brazil (2.3 percent or 0.89 million), and Australia (2.2 percent or 0.87 million), accounted for 64.6 percent of the 2008 total of nonimmigrant admissions. The overwhelming majority were tourist admissions. Citizens of South Korea (142,875), China (114,802), Indian (94,247), and Japan (70,244) made up 32 percent of the total 1.3 million foreign academic student admissions in 2008 (vocational students and students' family members are not included in these figures). Nationals of Mexico (66,990), Germany (51,507), Taiwan (45,603), the United Kingdom (43,529), Brazil (42,360), and Canada (41,245) accounted for another 22.1 percent. Together, the top 10 countries of origin represented 54.1 percent (or 713,402) of all foreign academic student admissions. Of all 409,619 temporary worker admissions under the H-1B "specialty occupation" visa in 2008, 37.8 percent (154,726) were from India alone (family members are not included in these figures). Five countries — India plus Canada (5.7 percent or 23,312), the United Kingdom (4.7 percent or 19,209), Mexico (4.0 percent or 16,382), and China (3.3 percent or 13,828) — accounted for 55.5 percent (227,457) of all H-1B admissions in 2008. In 2008, Mexico (70,812) and Jamaica (8,454) accounted for 75.8 percent of 104,618 H-2B seasonal nonagricultural worker admissions. The Philippines (3,684), Guatemala (3,216), Romania (1,756), South Africa (1,620), Israel (1,482), the United Kingdom (1,449), Australia (957), and El Salvador (754) accounted for another 14.3 percent (or 14,918). Four states — California, Florida, New York, and Texas — were the intended destination for half of all nonimmigrant admissions in 2008. In 2008, the most popular destinations for the 39.4 million nonimmigrant admissions (mostly tourists and business visitors) were the states of California (16.7 percent), Florida (15.2 percent), New York (14.2 percent), and Texas (7.1 percent). Of all 1.3 million foreign academic student admissions in 2008 (family members are not included in this figure), about half intended to study in six states: California (15.6 percent or 206,166), New York (12.8 percent or 169,110), Massachusetts (6.5 percent or 85,740), Texas (6.1 percent or 80,375), Florida (5.8 percent or 75,888), and Pennsylvania (3.8 percent or 50,355). Of all 409,619 H-1B temporary worker admissions (family members are not included in this figure) in 2008, 16.1 percent (66,031) intended to go to California, 15.5 percent (63,396) to New York, 8.1 percent (33,348) to Texas, 8.1 percent (33,292) to New Jersey, and 7.9 percent (32,451) to Florida. Of all 104,618 H-2B seasonal nonagricultural worker admissions in 2008, 19.0 percent (19,845) intended to go to Texas, 9.4 percent (9,834) to Louisiana, 9.1 percent (9,542) to Florida, 5.9 percent (6,211) to Colorado, and 3.7 percent (3,867) to Arizona. Data on nonimmigrant admissions from the DHS Office of Immigration Statistics. Batalova, Jeanne. 2006. The Growing Connection Between Temporary and Permanent Immigration Systems. Washington, DC: Migration Policy Institute. Available online. U.S. Department of State Visa Waiver Program.